In pregnancy, body’s weight will increase continuously. In addition, belly’s size also becomes bigger. Therefore, it’s difficult for pregnant women to find a suitable sleeping posture to help them feel comfortable and have good sleep all night. To limit the state of having difficulty in sleeping, experts advise pregnant women use the kinds of pillow that are used for pregnancy. This kind of pillow has benefits: It is smooth, pleasant, helps pregnant women keep the sleeping posture correctly. As a result, they won’t have pain in muscles, cramp, or hard neck in sleeping time and after waking up like normal pillows. The pillow that is used for pregnant women has 3 main kinds: pillow with letter J, C and U. They have the different effects. Pillow with letter J is as long as the body’s length. It will help pregnant women’s neck and head more comfortable and reduce tiredness in these 2 areas. Letter C pillow is different from letter J pillow. It is designed to support back and elbow. In addition, it also creates the comfortable feeling for the hip. This kind of pillow also creates the airier space for belly. Therefore, pregnant women can feel secure all night because they know that baby won’t be blocked in sleeping. In pregnancy, body’s weight will increase continuously. In addition, belly’s size also becomes bigger. 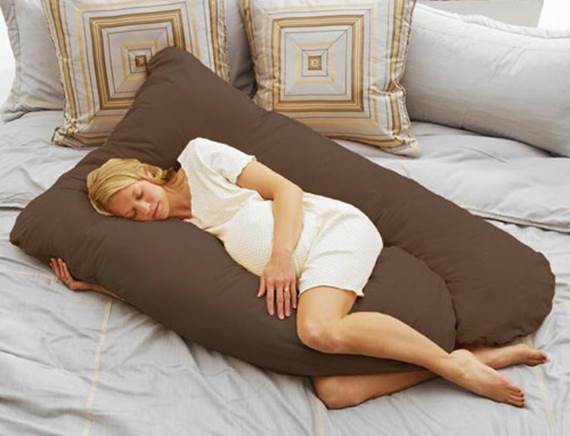 If pregnant women have insomnia, they should buy a sleeping pillow that is designed especially to sleep well. However, J letter pillow has defect that it only supports for head and neck while pillow with letter C cannot support back, belly in the same time. Therefore, pregnant women like to use letter U pillow although this pillow occupies a lot of area on the bed. The letter U pillow is a perfect choice because it can support back, belly, elbow and head of pregnant women. Moreover, women can feel comfortable with many different postures and change postures easily in sleeping. Therefore, if pregnant women have insomnia, they should buy a sleeping pillow that is designed especially to sleep well. To be comfortable before going to bed, pregnant women can ask the enthusiastic and devoted supporter – your husband to massage to help mother and baby relax. Some manipulations of massaging that your husband can help you are supporting head, relaxing neck, stroke eyebrow, rub back, shoulder and feet. Your husband can do the normal ways such as such as rubbing following circle, the method of stroking or sliding on skin. You can combine with essential oils that have scent such as lavender, mandarin, llang-ilang with the rate % for pregnant women (equivalent with 10 drops in 300 grams of therapeutic mixture). You can ask your husband to massage for you. However, before massaging, you should remind your husband to make his hands hot. In addition, he doesn’t wear ring or clock because they can cause scratch or damaging pregnant women’s sensitive skin. In addition, they shouldn’t use some kinds of essential oil that have contraindication in pregnancy such as basil, cedar, cinnamon, close, mint, jasmine to avoid stimulating spasm of uterus. Massing smoothly and correctly in pregnancy not only helps pregnant women relaxed, reduce stress, have good and deep sleep easily but also reduce stress in joints in hipbone, back or ankle, appease neck and backache of pregnant women. Massing also helps pregnant women improve attacks in nerves of hip, prevent the rick of cramp, release headache, and help blood circulate better. In addition, it has the effect in stimulating an d intensifying the best development for your baby.